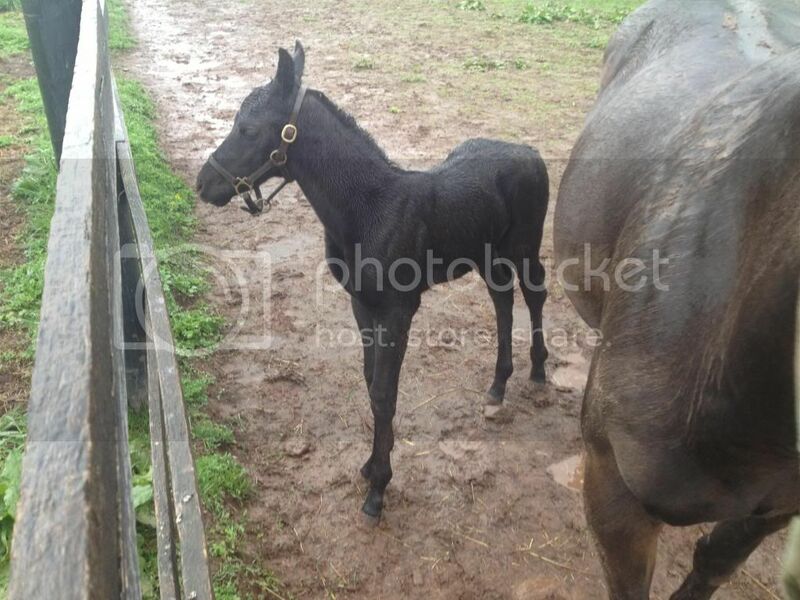 Post subject: Third true black foal of the year for us! Wonderful black colt born Apr 15. He is out of Outofretirement by Sir Knight Shadow. Needless to say, everything you could ask for all in one little package! This picture was taken at 30 hrs old. This filly was born on Apr 22 at the respectable hour of 10:30 PM. She is certainly a head stopper with those legs that go on forever and substantial build. Another true black sabino with white stocking on her back legs and a blaze. Picture taken at about 12 hrs old. Last edited by Pennylane Farms on Wed May 01, 2013 4:11 am, edited 2 times in total. As of last night it's 3 for 3. Another black TB colt with a big blaze and two white socks was born last night. Congratulations on the very nice run of little black kids this breeding year. 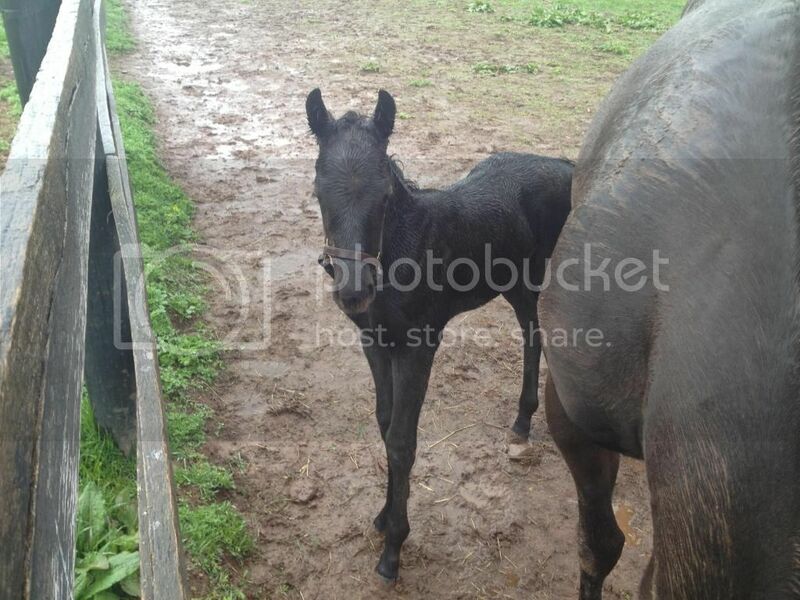 I foaled a black thoroughbred fillie on April 22nd(4 am). She does not have a white hair on her entire coat. 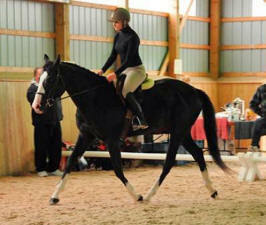 I am curious of how rare black thoroughbreds actually are. Especially TBs without a speck white. She is gorgeous. Her sire is dark bay or brown and dam is bay. I can't take my eyes off of her. I will post some pics when I can. Blue Feather ...hard to say. I was reading that thread on black TB's and it doesn't seem like there are many. But is it because the JC has them reg'd as bays or browns? I have a feeling it is. But would love to see a picture of your girl! I do know JC rarely registers A thoroughbred as black. I can only think of two on the top of my head, Black Onyx and Chapel Royal. Because Of that, I have been scrutinizing her. Looking for a brown hair anywhere, On her muzzle, on her flanks But I can't find a brown hair anywhere . Last edited by Blue feather on Mon Apr 29, 2013 10:40 am, edited 1 time in total. I do know JC Rarely registers A thoroughbred as black. I can only think of two on the top of my head, Black onyx and Chapel Royal. Like many black TBs foaled in North America Black Onyx and Chapel Royal are not actually registered as blk with the JC. Some I can think of that are registered as blk - R Js Harri and some of his foals, Black Vicar, Crunch the Numbers, Wicked Brew. There are more than a handful of others but undoubtedly a lot of true black TBs foaled are still being reg. as dk b. Obviously, the only way to be 100% certain of true blk is to have the testing done, unless both parents have been tested and are E/E or E/e and a/a, precluding the possibility of bay. Here are 2 pics of my fillie. I 'll try to get some better angles but it's a start. Blue Feather, she is adorable. I would definitely say black although I am no expert either! I honestly believe it is harder to find true blacks with the chrome rather that the solids though. Here is a picture of our third baby this year, his name (barn name) is Tucker and he is out of Honorable Action and sired by Sir Knight Shadow. This is his dam Honorable Action who tested EE / aa the same as Tucker's sire. Last edited by Pennylane Farms on Mon Apr 29, 2013 2:58 pm, edited 1 time in total. Nice!!! Goodluck to both of us!!! Chapel Royal and Black Onyx are not only registered brown, they are browns. They both have brown muzzles. That filly appears black but her nose does seem somewhat lighter to me. Blue feather ....very pretty girl and I'm no expert either but she sure looks black to me. If you get her DNA tested and confirmed as black, the JC will register her as black. You may have to make a special request, but they are registering them more. All the best with your girl! Last edited by Sunday Silence on Tue May 07, 2013 6:34 am, edited 1 time in total.